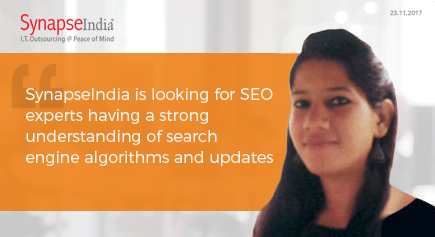 Apply for SynapseIndia jobs for SEO expert profile. To create a strong online presence, it is very important to have a thorough understanding of various SEO techniques. Being a SEO expert, your job responsibilities will include creating an effective SEO strategies to improve visibility of the website on the search engine result page. You must have a complete understanding of the latest SEO techniques as well as be aware of various search engine algorithms and updates. Shamit Khemka, SynapseIndia Founder and Director, says “Our team of SEO experts have an in-depth knowledge and experience in various SEO services like improving your search engine ranking, boosting your online visibility, enhancing website traffic and many more.” If you are innovative and are well aware with latest SEO updates, then apply immediately for SynapseIndia jobs.